We all love premium material on our phones. The Redmi 4 Prime (32GB) model is no exception, the whole back part is made of aluminum, but it can slip around uncomfortably after long work with the phone and there is a risk of the phone falling out of hand. That's why we recommend that you buy a back cover for your basic equipment to deal with this inconvenience. This original Xiaomi cover is made of silicone, so it sits nicely in your palm and you can hold your thumbs over a much larger screen area because you will not be afraid. Notice! 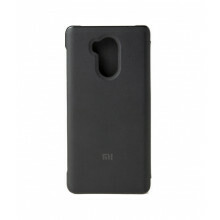 The case does not fit Xiaomi Redmi 4 16GB or Xiaomi Redmi 4A! It is designed exclusively for the Redmi 4 Prime / Pro 32GB!